Combine oil, vinegar, lime juice and garlic and pour half into a self sealing plastic bag and half into a medium saucepan. Add chicken to the marinade in the plastic bag and turn to coat all sides. Marinate in refrigerator for 1 to 2 hours. Prepare sauce by adding blueberries and raspberries to the marinade in the saucepan. Cook over medium heat 5 to 7 minutes stirring until slightly thickened. Remove from heat and set aside to cool. When sauce has cooled, pour into blender and puree. 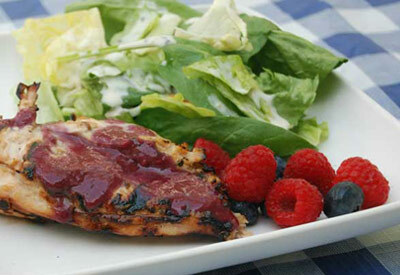 Grill chicken over medium heat cooking 8 to 12 minutes or until internal temperature reaches 165 degrees F. Serve chicken with the blueberry raspberry sauce.